I’m writing this blog to announce a slight shift in my business career, which has been evolving this year. Several longtime clients of Graff-Pinkert have asked me to help them find machining businesses to acquire and other owners have requested I find them a buyer for their businesses because they felt that I had the right network and skill set to do it. My initial inclination was that I’m purely a machinery dealer, not a business broker. But then I thought, why not try this. Perhaps I can add value for some people who I really care about. If I hit a dead end I’ll know soon enough. Currently I have four deal deals in process and have completed two. 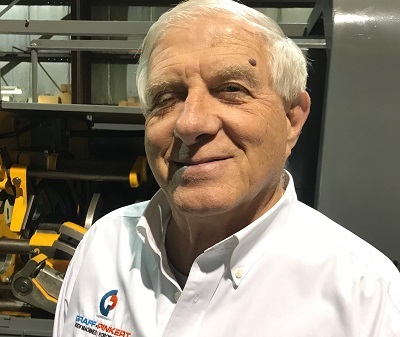 Lloyd Graff, Owner of Graff-Pinkert and Today’s Machining World. I have not approached this task like a traditional business broker who would contact private equity groups because my clients have preferred that I not publicize their decision to the world, thus jeopardizing their long-term relationships with customers and employees. Such a broad gage approach can also be toxic as far as tipping off the seller’s competitors who are good at sniffing out situations and taking advantage of them. Despite nondisclosure arrangements that supposedly insure anonymity in the market, a business broker soliciting offers is going to inadvertently leak a potential seller or elicit rumors. I have been able to keep a lid on leaks and rumors by connecting with prospects directly, because I have stuck primarily within my extensive network of relationships within the precision machining industry rather than try to cover the gamut of businesses in the marketplace. I also have focused on companies doing $20-million-in-sales or less, because I do not feel comfortable right now with bigger transactions. One trend which has surprised me is how many foreign firms are highly motivated now to enter the American market in this field and are looking for businesses in our sweet spot. Our extensive network of users, suppliers and other dealers worldwide has served us well in this search. To Europeans, South Americans and Asians America truly looks like the land of opportunity, and in many cases their existing customers are asking them to do business here. I don’t want to take on a lot of projects, because they are quite time consuming and I want to be able to give them the attention they deserve. I would like to work on 6 or 8 a year that I think I can shepherd to conclusion. I may not be long on mergers and acquisitions experience but I know the people in the machining business. It appears that my ability to “talk the talk” and really listen to people explain their needs resonates today in this field. This is a fascinating new gig for me, and I have Noah and Rex Magagnotti adding their knowledge and networking to help make it work. let me know if you come accross small CNC Machine shop for sale in Chicago or Milwaukee area. Funny that you go from a blog entry about not voting and having a problem with Trump to a blog entry about supporting the selling out of American businesses to Asian companies. Are those looking to retire not concerned with the next generation of machinists? Or of the technology transfer to China and other adversaries? Do they think a Chinese owner will not relocate restricted equipment from here to there? I’m sure these people will jump right on to the highest (likely Asian) bid to pad their pockets. All I see in the post is self-serving weakness with regard to anyone willing to sell to anything other than an American. Lloyd, that sounds great! Good luck with it! One indication of a good development in a business/career is when it occurs smoothly and naturally, and with minimal risk. Kelly, there is no shame in facillitating the sale of a business in which the owner has built equity and wishes to see the fruits of his or her labor and intellectual property. I feel really good about helping that to happen. Often I am helping an established family owned business with no successors find a happy exit that insures work for Their employees. I am really proud to be in a position to do this. If you need my services in the future I hope I am in a position to help you. Got any tool and die shops / machine shops in Northeast Indiana available to purchase?? Great read! The more of these shops we can keep up and running the more jobs with will keep.